As had happened in some other research aircraft programs, a fatal accident signaled the end of the X-15 program. On 15 November 1967 at 10:30 a.m., the X-15-3 dropped away from its B-52 mothership at 45,000 feet near Delamar Dry Lake. At the controls was veteran Air Force test pilot, Major Michael J. Adams. Starting his climb under full power, he was soon passing through 85,000 feet. Then an electrical disturbance distracted him and slightly degraded the control of the aircraft. Having adequate backup controls, Adams continued on. At 10:33 he reached a peak altitude of 266,000 feet. In the DFRC flight control room, fellow pilot and mission controller Pete Knight monitored the mission with a team of engineers. Something was amiss. As the X-15 climbed, Adams started a planned wing-rocking maneuver so an on-board camera could scan the horizon. The wing rocking quickly became excessive, by a factor of two or three. When he concluded the wing-rocking portion of the climb, the X-15 began a slow, gradual drift in heading; 40 seconds later, when the craft reached its maximum altitude, it was off heading by 15°. As the plane came over the top, the drift briefly halted, with the plane yawed 15° to the right. Then the drift began again; within 30 seconds, the plane was descending at right angles to the flight path. At 230,000 feet, encountering rapidly increasing dynamic pressures, the X-15 entered a Mach 5 spin. In the flight control room there was no way to monitor heading, so nobody suspected the true situation that Adams now faced. The controllers did not know that the plane was yawing, eventually turning completely around. In fact, control advised the pilot that he was ”a little bit high,” but in ”real good shape.” Just 15 seconds later, Adams radioed that the plane ”seems squirrelly.” At 10:34 came a shattering call: ”I'm in a spin, Pete.” A mission monitor called out that Adams had, indeed, lost control of the plane. A NASA test pilot said quietly, ”That boy's in trouble.” Plagued by lack of heading information, the control room staff saw only large and very slow pitching and rolling motions. One reaction was ”disbelief; the feeling that possibly he was overstating the case.” But Adams again called out, ”I'm in a spin.” As best they could, the ground controllers sought to get the X-15 straightened out. They knew they had only seconds left. There was no recommended spin recovery technique for the plane, and engineers knew nothing about the X-15's supersonic spin tendencies. The chase pilots, realizing that the X-15 would never make Rogers Lake, went into afterburner and raced for the emergency lakes, for Ballarat, for Cuddeback. Adams held the X-15's controls against the spin, using both the aerodynamic control surfaces and the reaction controls. Through some combination of pilot technique and basic aerodynamic stability, the plane recovered from the spin at 118,000 feet and went into a Mach 4.7 dive, inverted, at a dive angle between 40 and 45 degrees. Adams was in a relatively high altitude dive and had a good chance of rolling upright, pulling out, and setting up a landing. But now came a technical problem that spelled the end. The Honeywell adaptive flight control system began a limit-cycle oscillation just as the plane came out of the spin, preventing the system's gain changer from reducing pitch as dynamic pressure increased. The X-15 began a rapid pitching motion of increasing severity. All the while, the plane shot downward at 160,000 feet per minute, dynamic pressure increasing intolerably. High over the desert, it passed abeam of Cuddeback Lake, over the Searles Valley, over the Pinnacles, narrowing on toward Johannesburg. As the X-15 neared 65,000 feet, it was speeding downward at Mach 3.93 and experiencing over 15 g vertically, both positive and negative, and 8 g laterally. It broke up into many pieces amid loud sonic rumblings, striking northeast of Johannesburg. Two hunters heard the noise and saw the forward fuselage, the largest section, tumbling over a hill. On the ground, NASA control lost all telemetry at the moment of breakup, but still called to Adams. A chase pilot spotted dust on Cuddeback, but it was not the X-15. Then an Air Force pilot, who had been up on a delayed chase mission and had tagged along on the X-15 flight to see if he could fill in for an errant chase plane, spotted the main wreckage northwest of Cuddeback. 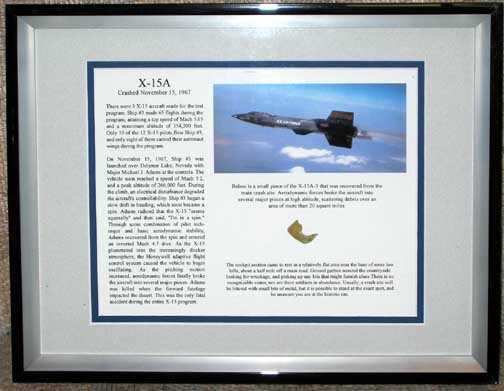 Mike Adams was dead, the X-15 destroyed. NASA and the Air Force convened an accident board. Very little remains at this site. In fact, aside from a small American flag posted in the center of the site, the average person would been totally unaware of the historic nature of their surroundings. Small, scattered pieces are sprinkled there, and finding anything of the aircraft at the site is nearly impossible (however, portions of the X-15A-3 such as an engine access panel, a reaction control rocket for maneuvering in the upper atmosphere, a piece of the horizontal stabilizer, and a section of vertical stabilizer that had the numerals '72' on it, were found as late as 1992). Rumor has it that the left wing has never been found.